I purchased this little guy at the market. when i got home i realized it was without an identification label... i would like to know what kind of plant i have so i can properly care for it. 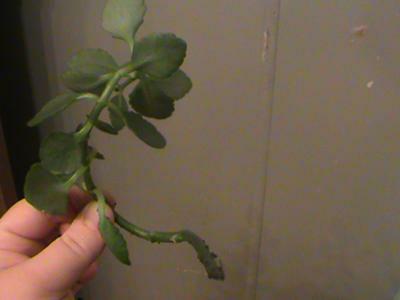 i'm not even sure it is a succulent, but it has nice thick fleshy leaves. 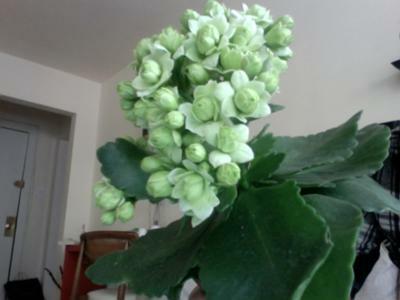 it has scalloped thick leaves around the base of the plant, and little light green buds that seem to turn a pale green/ white color as they open. it is about 6 inches tall. Drought Smart Plants reply: These are indeed a succulent plant - they are known botanically as Kalanchoe blossfeldiana, or Flaming Katy - not really a good name for this one with the white flowers, but they also come in bright pink, orange, yellow and red as well. They have been highly hybridized by plant breeders as they naturally bloom in the winter after they get a warm summer with some cooler nights as fall arrives. This triggers the flower buds to form, which then open starting in November, making them an ideal Christmas plant. 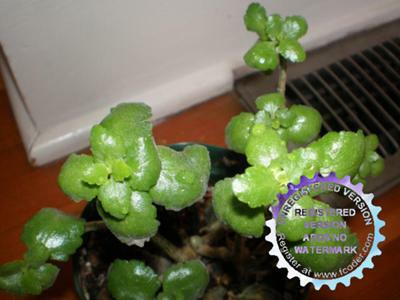 You can see more about these interesting plants here: Kalanchoe species; scroll down through the visitor submissions at the bottom of the page for some interesting and useful information and more views of similar plants. 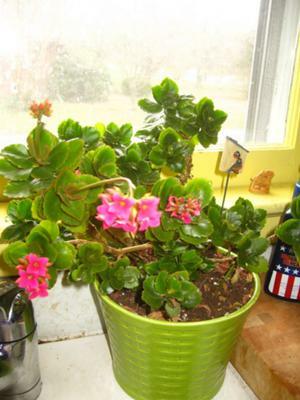 For general succulent care look here; these plants are very forgiving, and should bloom continuously for a few months, if you cut off the fading blooms, fertilize lightly, and give bright light. 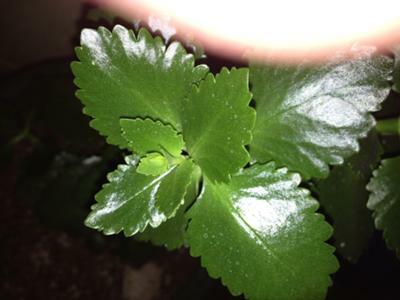 Large, waxy leaves near base of stalk. No sharp points on the leaves, instead are rounded. Stalk stems into smaller stalks holding reddish-pink flowers/buds. That's not 'Christmas Cactus' which is typically what Schlumbergera and a few other species are referred to. That's the problem with common names, because they often get stuck to other plants as well. 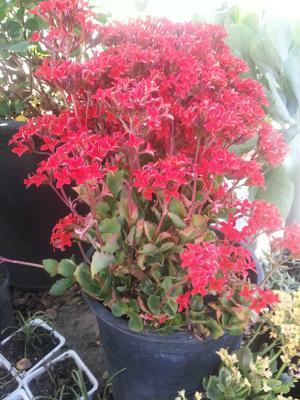 This plant is actually Kalanchoe blossfeldiana, and it's often given as a seasonal gift or bought to display around Christmas because there are very few other plants that bloom at that time (other than Poinsettia). 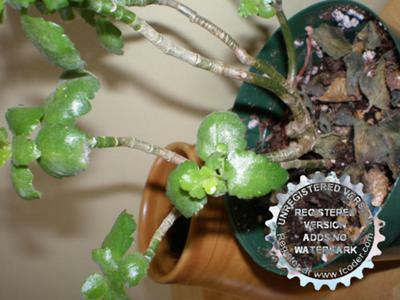 You can see more on the Kalanchoe species page - scroll through the entries at the bottom of the page. I don't recommend letting your cat eat any succulent, or any other house plant. There's more on poisonous succulents and more on which are safe. I have had this plant for 10 years and don't know what it is. This year it bloomed for the first time. Need to find out if I should take it out or leave it in. Well, I know if it was me, and I had the room, I would leave this plant right where it's at - it's gorgeous! 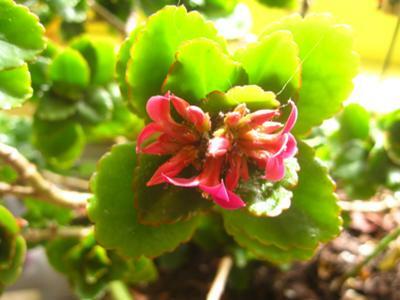 This is Kalanchoe blossfeldiana, one of the best of all Kalanchoe species, and as you've found, they are a little finicky in their requirements to set the buds to bloom. In most cases, they need to have a summer outdoors, with periodic watering, and then once the night temperatures cool down a bit, the buds will be in place for it to bloom, usually from November to March, just when we need it the most. They come in many shades of pink, red and scarlet as well as white, all very pretty. Have fun with your plant! 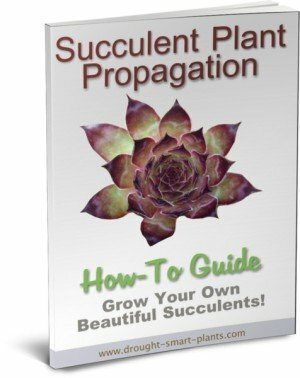 See also the page on succulent care. Wow! Thank you so much! It is so great to know something about this plant. It has been around for so long. And yes I had already discovered when you cut it back it is so easy to make new plants. The blossoms shown are actually from cuttings. the blooms on the plants themselves are yet to come. can't wait! I'd love to know what this plant is. We got it in a flower basket and it's so hardy and keeps growing and growing. 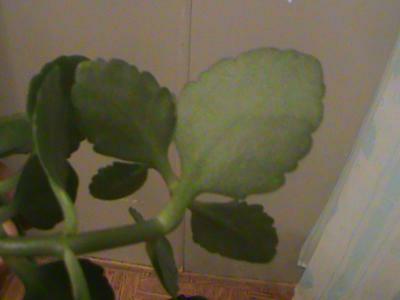 It has green leaves with scalloped pink edges. It gets clumps of small pink, 4 petaled, flowers. I have put in in a larger pot several times and it now looks so overgrown I guess I'll have to do it again. 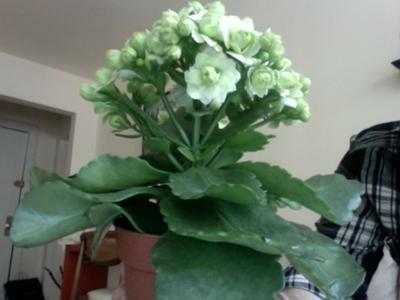 I really love the plant and would like to know what it is so I can better care for it. 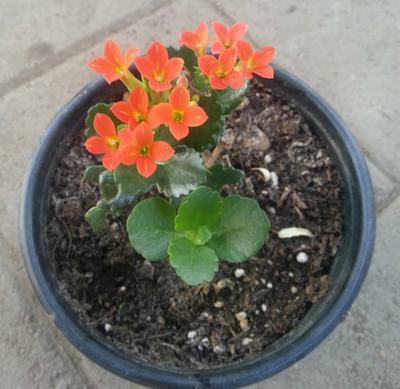 Drought Smart Plants reply: This lovely character is Kalanchoe blossfeldiana, or Flaming Katy. 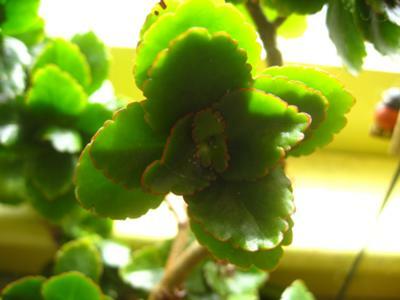 You can see more on the bottom of this page: Kalanchoe species. Many others before you have asked about this plant, which is rightfully popular due to the bright flowers, and the ease with which it can grow from cuttings. Best of luck with Flaming Katy! Hi Lew-Ann, this is one of the most requested plant identifications I get - the Kalanchoe species is wide and varied, but the Kalanchoe blossfeldiana is particularly attractive in bloom. These are commonly grown as houseplants, and you'll often see them in greenhouses and garden centers, and even in supermarkets. When they get tall and leggy, you can cut them into pieces and get lots of new plants, for giving to friends, or to put into planters on the deck for the summer. In the cooler nights of approaching fall, they will set buds, which then start to bloom in the later fall and through the winter. They come in all shades of pink, red and orange, even yellow and white, so you can collect the whole range for bright colourful blooms through out the winter. 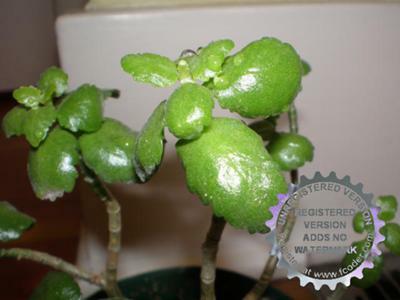 See more here: Kalanchoe species: scroll through the visitor contributions at the bottom of the page. Not sure if mine is a succulent but it acts like one. Dark green leaves that are waxy and variegated. When I bought it at the florist it had small pink/ fuchsia flowers but has never bloomed since in the last 4 years. The flowers were in clusters. 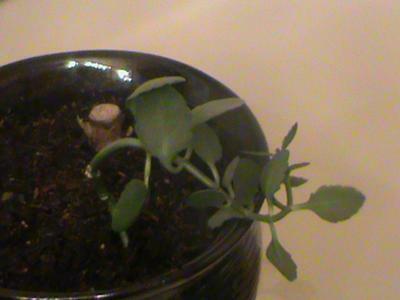 It recently started growing taller after a re-pot and started putting out roots on its own from a lower branch. Hi Lucas, you've got a Kalanchoe blossfeldiana, otherwise known as Flaming Katie, named after the brightly coloured blooms. 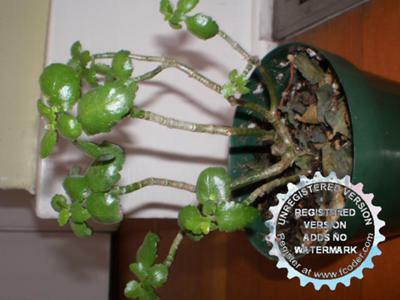 Have a look on the page about Kalanchoe species (where I've moved your submission to) and scroll through some of the other submissions. There are some useful hints and tips on how to get it to rebloom, by giving it a rest outdoors for the summer. 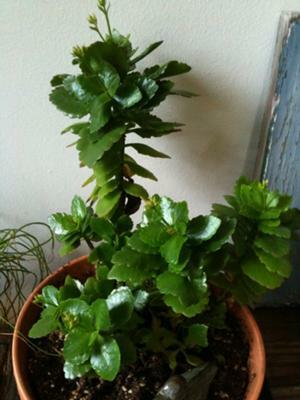 Other than that, these plants are easy to grow and care for, and very forgiving. 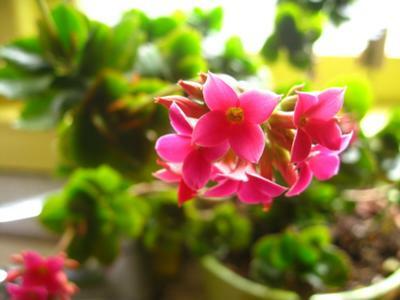 I like the bright blooms, which usually happen in the middle of winter, when we most need some cheering up! Good luck with your succulent plant! 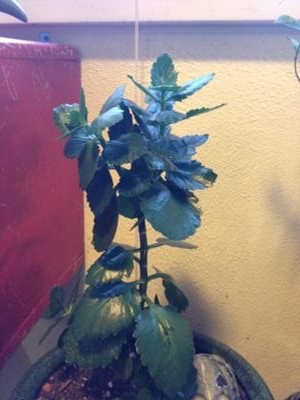 It has dark rubbery leaves, a long stem and the leaves kind of look like a ladder going up and at the very top of the stem has tiny yellow flowers. 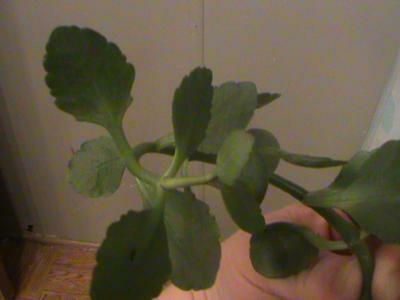 I had got a cutting from my grandmother she has been growing it indoors and it looks great; I've had the cutting for three days and the leaves are turning a green/gray color and the leaves fall off very easy. Drought Smart Plants reply: Hi Kindra, this is one of the many Kalanchoe blossfeldiana hybrids, well known by their other name of Flaming Katy, for the bright flowers in all kinds of bright colors. To care for these iron tough plants, be cruel. You are most likely overwatering it; stop right now, or it will rot for sure. These are hardy and drought tolerant plants, and don't like or appreciate your tender loving care, or too much water. They also require bright light once established, so indoors they need to be in a south window, not in a dim area. 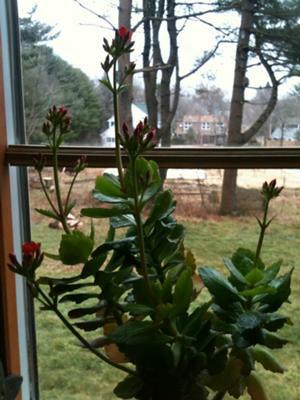 You can see more here: Kalanchoe species and see more about succulent care here. Please can you help? 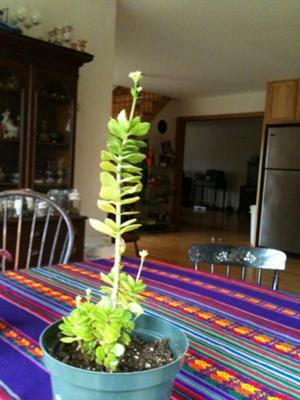 I have my plant in the kitchen - I turn it daily so it doesn't lean one way but just seems to get taller and taller. Where do I pinch out the leaves so it bushes out? It has not flowered either though it did at first little pink ones, otherwise is healthy. Always pinch or prune above a set of leaves that you want to keep. Makes sense, right? See more about pruning here. P.S. Sorry about the watermarks on the photos - I used a demo program to convert them into a smaller size. No worries about the watermarks - at least you sent pictures - it makes my job of performing this service much easier! Thank you for your nice comments. I'm pretty certain that this plant is one of these Kalanchoe species, most likely Kalanchoe blossfeldiana, otherwise known as 'Flaming Katy' and other similar names, due to the bright long lasting flowers in the winter. It looks as though someone probably enjoyed it while it bloomed, but then didn't know what on earth to do with the poor thing once the stems got longer and bare. Kalanchoe are one of the easiest plants to propagate, so this will be a great way to get more (and much nicer) young plants to display and give away to other succulent plant afficianos. You're very welcome - I hope you don't mind, but I've used one of your pictures on the page about Pruning Succulent Plants - I think it illustrates perfectly how to cut the long leggy stems, and get even more plants. Cool! :) I'm so glad that the picture could be used! My dad got some plants in the nursery but not sure what they are. We think they are succulents. The flowers are orange, red, or yellow. These are some of the most commonly grown succulents, and you can see why. They have the most exuberant blooming habit, which goes on indefinitely. You can see more about these beautiful plants here. 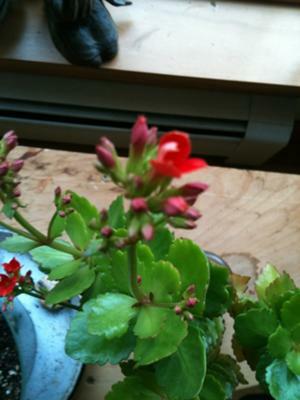 Look for Kalanchoe blossfeldiana, which is also known as Flaming Katy.